Wow. I think I better say it again just in case you didn’t hear me…. Wow…. I must confess when I first started playing this game, despite how good it looked, that I was gonna rip it out of my machine, snap it in half and set fire to it! See this is not the sort of game that you might be used to, like the Tony Hawk series which most of us have played and enjoyed. That is one of the first things that will come to mind here. This game is not trying tobe Tony Hawk in any shape or form. It’s not some half baked rip off either, with a genuine style and grace of its own. Yes, that’s right, a game that defines itself, and doesn’t try to rip off the king of the heap. From the intro, immediately you can tell that a lot of care has been taken with one of the best and funniest intros to a game that I’ve seen in some time. 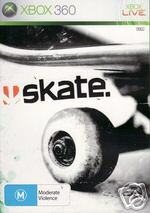 It’s a live action sequence featuring skaters that you will immediately recognize and is really well put together. I don’t want to spoil it for you, all I can see is that it has to be seen to be believed. Click here to watch the trailer, I’m sure you’ll love it! It’s after this point that you realize once you get into the game that EA really wants you to skate. Not just button mash but possibly bring you the most indepth realistic skate experience you’ve ever experienced whilst being a couch potato at the same time. Most of the things that you experience in the game you will be able to relate to, especially if you are a skater feel extremely real. 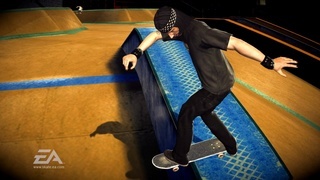 Unlike other skate games, you do most of your skating (tricks) using the analogue sticks. So say for example that you want to ollie, then you have to flick the sticks to do it and the combinations that are available are amazing all depending on the angle you flick. That’s the crazy thing about Skate; you really determine what happens to your player in what could almost be termed a skating simulator. 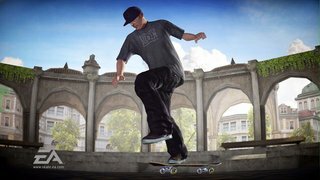 Graphics in this title would also have to be amongst the most realistic I’ve seen in a skating game also. There were times where I actually had to blink before I realized that it was in game footage and not simply a video. There is a pretty massive learning curve on this game, especially if you are used to skating games by other companies where you have to just handle button mashing to pull off insane tricks, your fingers will find themselves going instinctively to press buttons that have no effect in this game whatsoever. It’s certainly a case of back to the drawing board and teaching an old dog new tricks. The title really gives you the feeling that you are achieving something when playing the game and getting a trick right is extremely rewarding to say the least. The skater and board somehow feel really connected to the sticks and doing tricks like grinding become natural when you ollie and line up the board in the manner that you would in real life. It’s really cool and becomes somewhat obsessive in practicing to get tricks right. As you get better at skating and completing the various tasks set before you, you’ll earn the right to go in comps and video shoots. There are basic games to play against the AI and a more challenging test of your skills to come further in the game. However with the open world presented by the title, it’s entirely up to you. If you want you can simply just skate around all day. This is a must have purchase for any fans of skateboarding and is truly the first of it’s kind to have such realism presented for your enjoyment. This is no idle slap together, it’s the real deal and you gotta check it out for yourself.